St. John Brewers is the only microbrewery on St. John! Featuring a restaurant along with a tap room that showcases the St John brewery’s popular beverages, St. John Brewers is a great destination for a drink and some fun during your stay with CimmaronStJohn. The doors are open from 11am to midnight Monday through Saturday and noon to midnight on Sunday. A full bar is available for the beer and non-beer drinkers alike, featuring a great signature menu. The air-conditioned interior bar is complimented by two outdoor patios meant for relaxing and catching some extra rays. You can cool off inside or keep those sunglasses on and enjoy the pristine St. John weather that you just can’t find anywhere else! Take a break from the beach during your vacation and head inside to the air-conditioned bar at St. John Brewers tap room. Whether you opt for a beer or homemade soda or St. John Brewers root beer, you will find plenty of cold beverages waiting to be served. The flagship beer at St. John Brewers is the Tropical Mango with subtle malt notes and some hop. This light pale ale with a mango taste will have you on Caribbean time in no time! The Island Summer Ale is a filtered half wheat, half pale ale with a smooth finish. Liquid Sunshine Ale will bring you coriander spice and Curacao orange peel, while the Island Hoppin’ IPA has a bright copper color and citrus hop aroma. The Amber Jack is a year-round favorite among locals, while the seasonal Frozen Cistern Winter Ale features roasted barley, coffee, and chocolate malt. During happy hour (from 4-6pm), all draft beer is $1 off, and pizzas are half-price! There is also a coffee stout, great to pair with a chocolate dessert, and double IPA, ideal to drink with some spicy menu options or strong cheeses. You will want to pair your St. John Brewery beers with some delicious, rejuvenating food. After all, the beach and more island adventures are still waiting for you! Appetizers on the St. John Brewers menu include a warm Bavarian soft pretzel with nacho cheese, homemade hummus with toasted pita chips and veggies, bacon-infused beer cheese with pretzel bites, baked potato skins, and pulled pork nachos. Yum! You can also opt for a personal pizza, with flavors such as meat lovers, Mexican, and margarita. Sandwiches include a staff favorite pulled pork, blackened Mahi, Caribbean jerked chicken, hot dog, and burger. Wraps, such as a gyro or fish tacos, are served with a pickle and coleslaw, pasta salad, or chips. Top everything off with a root beer float! The great atmosphere, including the two spacious outdoor patios, at St. John Brewers offers great food and beer along with some island fun. Enjoy the crowd, let loose, and enjoy your vacation! 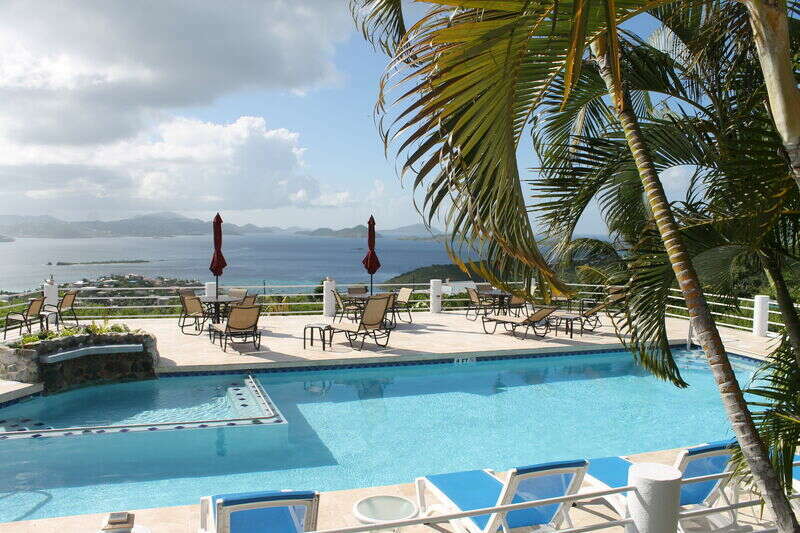 After all the fun is had, head back to your peaceful CimmaronStJohn vacation villa and indulge in spectacular panoramic views, private pool decks, and the ultimate luxury. You deserve the best!